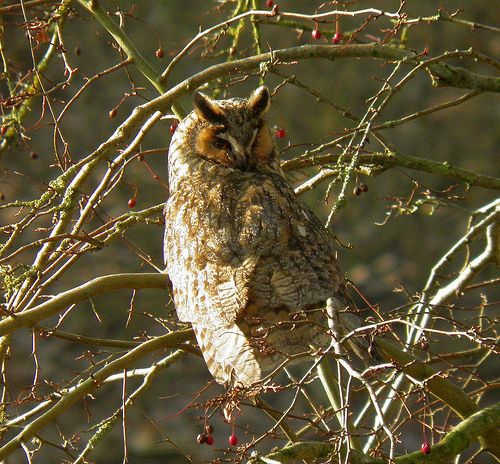 Sitting on a branch of a tree the Long-eared Owl is easily recognised by its large ear tufts. When flying it presses them against its head. When begging for food, the young Long-eared Owls can make a lot of noise with complaining and screaming sounds. The Long-eared Owl has large ear tufts on top of the head and thin black stripes on the tail. 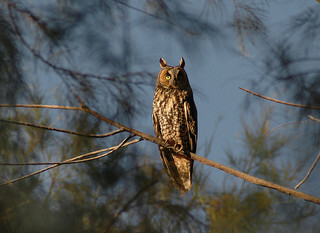 The Long-eared Owl is smaller and more slender.